Audi Side Assist is a technology designed to help drivers to change lanes safely. Two radars, one on either side of the car, are mounted in the rear bumper. At speeds above 30km/h, these radars monitor the traffic in a zone which extends from around 70m behind the car to a point just ahead of the driver, and includes the so-called ‘blind-spot’. 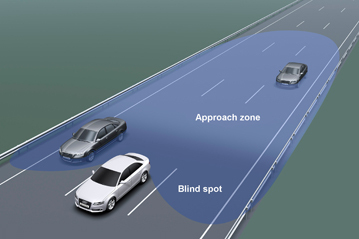 However, Audi Side Assist does more than simply check for vehicles in this blind-spot. By measuring the distance and speed of vehicles approaching from behind, Audi Side Assist is able to calculate whether or not a change of lane would be hazardous. If there is no apparent intention by the driver to change lane, a light situated in the door mirror on the relevant side of the car is illuminated. The light provides information to the driver that there is a potential threat. If the driver uses the direction indicator to signal that he intends to change lane, the warning light flashes more intensely, signifying to the driver that the manoeuvre he is about to make is potentially dangerous. The system works when the car is overtaking as well as when it is being overtaken, to ensure that the car can be safely returned to its lane. Audi Side Assist is a technology developed by Audi to help drivers to make safe lane changes amongst traffic moving in the same direction at speeds above 30km/h on highways. The distribution of injury severities in accidents involving a lane change is similar to those which occur across all accident types. Audi Side Assist operates at speeds above 30km/h and is designed to address lane-change accidents which are typical of highway and motorway driving. Accordingly, it has the potential to help avoid higher-speed accidents and more severe injuries. Estimates vary as to the benefit which might be expected. One analysis predicts that lane change assistance technologies could affect around 20% of off-path fatalities in Sweden. Audi estimates that, in the accidents which could be addressed by Audi Side Assist, some 80 percent of the injuries are currently fatal or severe, compared to around a half for all accident types. Audi Side Assist does not switch on by default at the start of each journey. The status of the system is stored in the key and automatically returns to the last setting used by the user of that key. The driver can manually turn the system on and off. In bends, Audi Side Assist may react to a following vehicle which is two lanes away, not in the next lane. Similarly, if lanes are unusually narrow (in road works, for example), the system may warn of vehicles in a non-adjacent lane.The system depends on clear detection by the two radars which might be impaired in adverse weather conditions (very heavy rain or snow etc). A mounted trailer might interfere with the radar’s operation. Audi Side Assist is automatically turned off when a trailer is connected to an Audi towing bracket but must be manually deactivated for trailers connected to brackets of other makes. Audi have tested the system extensively during its development. Controlled tests were done on a track to establish the correct response of the system in a wide variety of overtaking manoeuvres, covering a range of relative speeds between vehicles. These trials were also used to ensure that, to the extent possible, false warnings are avoided i.e. that no warning is given for vehicles which are not in the adjacent lane, and which do not pose a threat. In addition, extensive road testing was done by professional drivers in different traffic and weather conditions. A customer survey has been used to demonstrate a high level of satisfaction by users, a critical parameter in ensuring continued use.